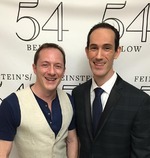 David Sisco (left) and Tom Gualtieri (right), Photo Credit: Jonathan BellerI was so excited when I found out Tom Gualtieri & David Sisco were going to be presenting an evening of their music at Feinstein's/54 Below this coming January! I have known Tom for a few years, but have yet to experience Tom & David's work together, so when the opportunity came up to interview them, I was eager to hit every note & learn about this dynamic duo! After interviewing Tom & David, I'm really looking forward to hearing their music. 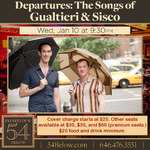 Departures: The Songs of Gualtieri & Sisco will play Feinstein's/54 Below on Wednesday, January 10 at 9:30pm. Click here for tickets! For more on Tom & David visit http://www.tomgualtieri.com, http://www.davidsisco.com, and follow them on Facebook and Twitter! 1. Who or what inspired you to become composer/lyricist? David Sisco: For me it was melding my love of classical music with the American Songbook and popular music. Our diverse interests made us oddly right for each other as a composer/lyricist team. Tom Gualtieri: I’ve always been drawn to storytelling whether it was through acting, directing, or writing. And with my love of all kinds of music – classical, pop, opera, standards and contemporary - the addition of lyric-writing seemed a natural progression. 2. How did you come to work together? 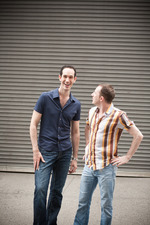 David Sisco: We met in the BMI Lehman Engel Musical Theatre Workshop in 2003. The first two years of the Workshop are driven by exercises designed to expose theatre writers to all the facets of dramatic songwriting: structure, storytelling etc. Through each assignment, writers meet potential collaborators. Tom Gualtieri: David and I were paired for one of the oldest exercises in the Workshop: we had to write a song for Willy Loman in an imagined, musical version of DEATH OF A SALESMAN - a notoriously difficult exercise because parody was not allowed. The songs had to be legit. David Sisco: There were some beautiful songs written by the writers of the Workshop, but it is a daunting exercise. Tom Gualtieri: We discovered that we had a similar musical sensibility and loved the same types of music and drama. We favor innovative and intellectually stimulating musicals but also appreciate what would have been called "musical comedy" back in the day. 3. On January 10, you are returning to Feinstien's/54 Below with a new collection of music, Departures: The Songs of Gualtieri & Sisco. What excites you about this upcoming concert? Tom Gualtieri: We've set aside two projects in the last couple of years and we didn't want to go an entire year without working as we search for a new one. We decided to put our energy into practicing the most important part of our collaboration: the actual writing of songs. We made it a goal this year to examine contemporary and pop forms and filter them through dramatic storytelling. So, the songs in Departures are a hybrid. David Sisco: Also different from our previous concert is that many of these songs were initiated by talking about our personal experiences. Because of that, I think the audience will get to know us even better as writers and individuals. Tom Gualtieri: I should add that we are also excited to be working with Laura Josepher again. She’s directed all of our past projects and she seems to understand our work. She asks the right questions. She holds our feet to the fire when necessary and praises us when - IF - it’s appropriate. David Sisco: Any opportunity to work with Laura is a blessing. We think she's one of the best unsung directors in the business so we're lucky to have her. 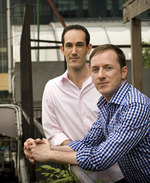 David SIsco (left) and Tom Gualtieri (right), Photo Credit: Jonathan Beller4. What do you think will surprise fans about these new songs? Tom Gualtieri: The people who are familiar with our work know us best for traditional theatre songs. We've been bringing our voice to traditional styles and forms since we started our collaboration, but now we've had a great shift toward contemporary, musical landscapes. David Sisco: We're not giving up our classical and traditional influences, but we're also trying find this new facet of our voice. Tom Gualtieri: In "the old days" - that is, the golden age of musical theatre - popular music and theatre music were the same. Some of the great standards come from musical theatre. After a long dry spell, musical theatre has entered a new golden age - and we think that's partly due to the crossover appeal of contemporary musical theatre. David Sisco: Our fans may be surprised that many of the songs in Departures are heavily influenced by pop structure. 5. Since this concert celebrates and skewers contemporary life & relationships, what has been the best part about working together and the most challenging part? Tom Gualtieri: David and I work well together - we've got a shorthand after 14 years of collaboration - but no matter how at ease we are as a team, it's still tricky to tell your collaborator, "I'm not crazy about this or that idea." Tom Gualtieri: If it needs to change, we change it. Writing is a process of rewriting, after all. David Sisco: And because of that, we are pretty merciless self-editors. The most important thing is the work itself. There's a 'just do it' attitude that helps us as we look toward the ultimate goal: writing good songs. Tom Gualtieri: We're tremendous fans of each other's work so that makes it easy - most of the time. Haha! Tom Gualtieri (left) and David Sisco (right) at Feinstein's/54 Below6. Press notes also state these songs in the January 10 concert explore the intersection between compelling storytelling & exciting musical form to create a dynamic cycle of songs/ What do you feel makes a song compelling & exciting? Tom Gualtieri: All genres have unique qualities that are compelling in one way or another. With pop music, many people don't listen to the lyrics but for me, a song is most exciting when it reveals something through a combination of music AND lyrics. An exceptionally "hooky" song might be spoiled by rotten lyrics and on the opposite side, great lyrics can go unnoticed if the song isn't musically compelling. Artists like Joni Mitchell and James Taylor write gorgeous lyrics but more current writers like Ed Sheeran and Sara Bareilles also bring tremendous intelligence to the table and still create hook-driven, emotionally rich work. David Sisco: For me, it's the specificity of the lyric and music, which Tom is hinting at, that make me want to listen to a song more than once. Songs (in any genre) than can walk the tightrope of neither being overly poetic or too on-the-nose - that make the listener fill in the blanks, getting them emotionally invested in the storytelling - excite me the most. 7. 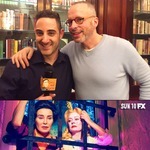 I love that you are collaborating with book writer Michael Zam (FX Feud) on a project. What, if anything, can you tell us about this piece? David Sisco: We are adapting Henry James' THE WINGS OF THE DOVE. Tom brought this to me years ago but we kept getting distracted by other ideas. Most recently we decided, after setting aside two projects, that it was time for us to let someone else do the adaptation. Tom and Michael have known each other for years and we proposed it to him. He's a brilliant guy and he came up with a thrilling concept for this. Tom Gualtieri: Something that's not been done before in a musical. Tom Gualtieri: It ain't beach reading. But THE WINGS OF THE DOVE is a beautiful story with fascinating characters and gorgeous settings - London and Venice at the turn of the century - so it will transport us to another world. Call Me Adam and "Feud" writer Michael Zam8. Since Michael was a writer on the hit FX series Feud, if you had to write one original song to sum up the series, what would you call it and what would be just a few lyrics? Tom Gualtieri: Haha - we are SO INSANE right now that trying to answer this question is like putting a straw on the back of a camel that has walked through the Sahara without water. But off the top of my head, I'd write a song based on something Bette once said, "Old Age Ain't No Place for Sissies." 9. What do you hope this new year brings for you with regards to your music? Tom Gualtieri: We love writing something that makes a singer WANT to sing and we hope that continues to happen. We're also incredibly excited to get started on THE WINGS OF THE DOVE. David Sisco: Writing for this concert has also challenged us to write faster and, we think, helped our actual writing process evolve, which is a pretty neat trick after all these years. We look forward to continuing that conversation as we work on new projects. Tom Gualtieri: More than anything, we want to share our work. All of the songs from this concert will be available online when the sheet music is finished and proofed. So we hope people will use our work for auditions, cabaret, and concerts. David Sisco, Photo Credit: Roberto AraujoTom Gualtieri, Photo Credit: Rob Sutton10. If you had to select one of your songs to describe today's climate, which song would best represent where we are at politically & socially? Then, which of your songs would you say provides hope? Tom Gualtieri: So, there are two pieces here: the social and the political. The political climate today is detrimental to everyone's health. David Sisco: And we’re not just talking about the news coming out of Washington, but also the social messages we are getting from elected leaders. Tom Gualtieri: One of the ways artists can affect change is by taking up the issue of diversity in our industry. David Sisco: We get frustrated when theatre pieces, which are not specifically about issues of race, sexual identity, or those with perceived disabilities, are cast in ways that do not reflect diversity nor draw from the enormous pools of talent which remain underrepresented. Tom Gualtieri: Those are huge subjects to tackle and our writing tends to focus in on individuals and their personal experiences. There are two songs in our upcoming concert which capture small aspects of the anger and anxiety that buzzes through our culture right now: "My Call to Fly" is about finding your inner strength in the face of cynicism, and "Compared to You Blues" is a comic song about the negative effects of social media. David Sisco: We think our most hopeful song is a non-political one called "Morning, Love." It's a deeply personal song about looking for love - looking for that one person you know is out there waiting for you and feels the same way. In these most-troubled times, we need love. Maybe now more than ever. 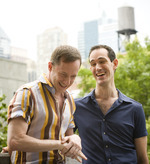 Tom Gualtieri and David Sisco began their collaboration at the BMI Musical Theater Workshop in 2003. Their first musical Falling to Earth, has been developed through the Syracuse University New Play Workshop and The York Theatre Developmental Reading Series. They have provided material for We Are the Song, sponsored by the After The Storm Foundation, which offers assistance to the youth of post-Katrina New Orleans. Currently, they're working on a new musical entitled I'm Afraid, You're Afraid: 448 Reasons to Fear And Why. Tom and David are the recipients of a grant from the Anna Sosenko Assist Trust and their songs have been featured in various cabarets and concerts. In addition to their writing partnership, they appear on stage together in David’s multi-award-winning comedies BAIT n’ SWISH. They have also led seminars and workshops on a variety of topics, and were featured lecturers and performers at the 2011 MTNA/NATS Conference.